I don't stray outside wargaming on this blog but every now and then there is something deeply personal that I wish to highlight. The events at Hillsborough in 1989 are one of those things. Cut to its quib 96 Liverpool fans went to watch a game of football and through no fault of their own, didn't come home. After the disaster, the Police blamed the fans. But equally as bad, "The Sun" newspaper in the days after the event (and before the bodies were buried) peddled their rag with such offensive stories and headlines that the people of Liverpool instituted an embargo that has lasted to this day. In one infamous story, they used a nameless source to say that Liverpool fans urinated on the police and on the dead bodies of fans laid out on the pitch. It was a lie, and today they have finally admitted it. Prime Minister David Cameron revealed on Wednesday that findings from the independent review into the tragedy at the Sheffield ground - as it hosted an FA Cup semi-final between Liverpool and Nottingham Forest - showed the safety of the crowd was compromised on "every level". Cameron revealed that police officers had subsequently tampered with evidence and eye-witness accounts in a bid to deflect blame for the deaths onto the fans, evidence that The Sun relayed in an infamous article entitled 'The Truth' - which blamed Liverpool fans for the disaster. The Prime Minister stated that the article was "clearly wrong and caused huge offence, distress and hurt", before outlining the extent of the police cover-up. "[The] report finds that 164 statements were significantly amended - and 116 explicitly removed negative comments about the policing operation - including its lack of leadership," he added. "The report also makes important findings about particular actions taken by the police and coroner while investigating the deaths. "There is new evidence which shows that police officers carried out police national computer checks on those who had died in an attempt - and I quote from the report - 'to impugn the reputations of the deceased'." Liverpool fans have long boycotted The Sun as a result of their coverage of the Hillsborough tragedy. After Wednesday's findings, the newspaper - owned by Rupert Murdoch's News International - belatedly issued a full apology. "Twenty-three years ago the Sun newspaper made a terrible mistake," current editor Dominic Moynihan said. 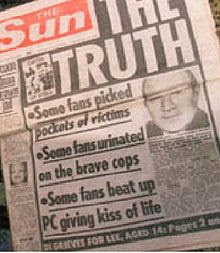 "We published an inaccurate and offensive story about the events at Hillsborough. We said it was the truth - it wasn't. 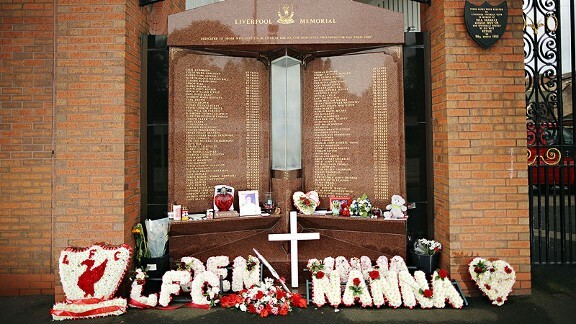 "The Hillsborough Independent Panel has now established what really happened that day. It's an appalling story and at the heart of it are the police's attempts to smear Liverpool fans. It's a version of events that 23 years ago The Sun went along with and for that we're deeply ashamed and profoundly sorry. "We will also reflect our deep sense of shame." The editor of the newspaper at the time the article was published, Kelvin Mackenzie, offered his "profuse apologies to the people of Liverpool for that headline". He added: "It has taken more than two decades, 400,000 documents and a two-year inquiry to discover to my horror that it would have far more accurate had I written the headline 'The Lies' rather than 'The Truth'. I published in good faith and I am sorry that it was so wrong." South Yorkshire chief constable David Crompton also said he was "profoundly sorry" for the conduct of the force during the disaster and in its aftermath - promising those who doctored statements and the like will face punishment. "I think that if people [police officers] are shown to have acted criminally then they should face prosecution," Crompton said. "In the immediate aftermath senior officers sought to change the record of events. Disgraceful lies were told which blamed the Liverpool fans for the disaster. "I am profoundly sorry for the way the force failed on 15th April 1989 and I am doubly sorry for the injustice that followed and I apologise to the families of the 96 and Liverpool fans." In a statement, Liverpool chose to pay tribute to those who have campaigned tirelessly for the truth surrounding the Hillsborough Disaster to finally be published. "Over the last 23 years the families who lost loved ones and the survivors of this terrible tragedy have shown immense dignity and resilience in their tireless campaign for justice," the statement read. "Liverpool Football Club commends the Hillsborough Independent Panel report which acknowledges the avoidable catastrophic failures before, during and after the disaster. The club also welcomes the Prime Minister's apology to the families and survivors on behalf of the Government and await the Attorney General's pending review of the report. After 23 long and painful years, our fans have finally been fully exonerated of all blame. "The world knows what we have always known, that Liverpool fans were not just innocent on that terrible day but that there was reprehensible and hurtful misrepresentation of the truth."